Stained Glass Effect Border Designs with Patterned Frosted Film Panel. Made easy by Purlfrost. Home Decorative & Patterned Window Film Stained Glass Border, Frosted Pattern. Stained Glass Border, Frosted Pattern. 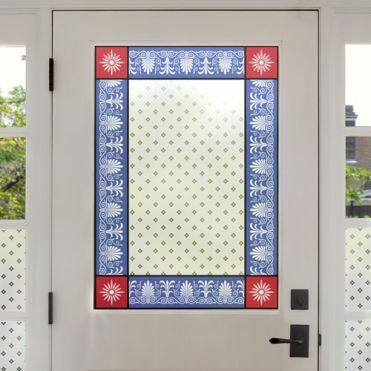 Vintage frosted glass patterns, combined with a stained glass film border and coloured "Glory Stars" in each corner. 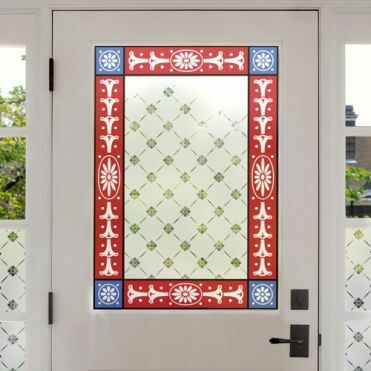 A timeless Victorian glass design, made to measure, at a fraction of the cost of the real thing. This design is re-sized to your exact requirements. We have over the years researched and photographed original designs - doors and windows seen on the street, in architectural salvage yards, antique fairs as well as pictures found online. The pictures have then been redrawn and graphically reproduced, often mixing elements from different sources to produce the unique options you see here on our website. The result is that these designs can be made to fit your measurements for the doors and windows you already have at home. No need to replace the glass, your doors and windows can be given a new lease of life and literally can be transformed in minutes. Not to worry. The service is completely bespoke so just enter your measurements and we will resize the stained glass pattern to suit. Is the stained glass film applied internally or externally? How easy is the stained glass film to apply? Very easy. But don't take our word for it. Read our fantastic Trustpilot reviews, they're all genuine. To apply the film, all you'll need are a few basic tools, and we even throw in a small application tool with your order for free. Soapy water is the key ingredient, which allows you a bubble free application. The application process is very easy using a wet application method. Please watch our easy to follow steps on our video tutorial.